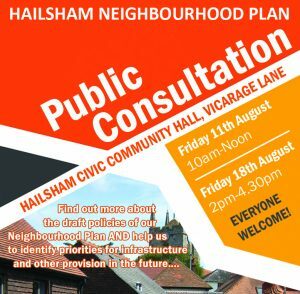 Hailsham Town Council invites local residents to attend its next Neighbourhood Planning public engagement events which will be held at the Civic Community Hall in Vicarage Lane on Friday 11th August (10am-noon) and Friday 18th August (2pm-4.30pm). 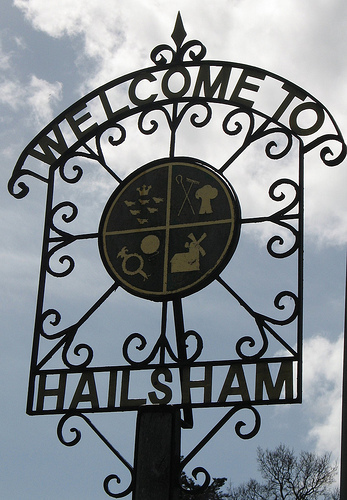 Residents will be able to find out more about the draft policies of the Hailsham Neighbourhood Plan at both consultation events and help the Neighbourhood Planning Committee identify priorities for local infrastructure and other provision in the future. More information about the neighbourhood planning process will be available, including the Committee’s achievements to date and residents will have the opportunity to view maps and display stands, ask Committee members any questions about the way forward with the Plan and have their say on how future housing development can best be accommodated in the future. Free softplay equipment will be available for children aged 0-5 years at both events. More information on both public engagement events will be announced in the coming weeks. “The Hailsham Neighbourhood Plan is our opportunity to plan the future of our town and we would like as many interested people as possible to attend the public engagement events in August, find out more what this all about and see if you can contribute,” said Councillor Glenn Moore, chairman of the Neighbourhood Planning Committee. Keep large shops (i.e. supermarkets and department stores) out of the town centre. Keep vehicles out of town centre as much as poss. to minimise traffic air pollution hanging in the centre. more trees to clean the air and add feel good factor and encourage wildlife. Large parks and walkways with trees and bushes and wildflower /picnic areas. Water/ponds are also good for wildlife and the people feel good factor. Encourage walking and cycling not road traffic. Free carparks to encourage visitors from outside. Maintain any old buildings that have survived the disastrous planning of the past. a whole generation of housing and jobs . It would have been good if you could have held these consultations at a time when people who work could have attended. There is not even any during a lunchtime let alone an evening. How many residents of Hailsham will not be able to attend and therefore be involved in the consultation process? Was this not considered when arranging these to give the opportunity for a fair representation of the views of full cross section of society?